07 May It is Just So Pretty This Week! Last weekend, my husband and I were sitting on the deck, enjoying the warm sun and the flowers. He turned to me and said “The magic is beginning to reappear in the garden.” I knew just what he meant. Finally, it feels, looks, and smells like spring! Glorious trees in full bloom. The sweet scents of lilacs and daffodils fill the air. I wake up at dawn, windows open, to the sound of the birds singing. I stroll my yard at dusk and see the first hummingbird of the season flitting away from my quince bush. We have been eating freshly harvested asparagus all week. Life is good. Heaven! 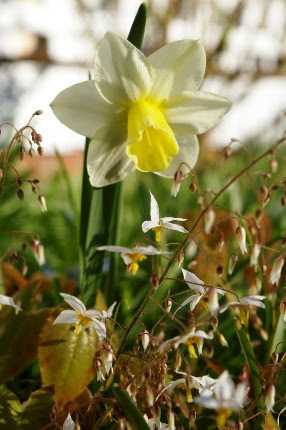 The late blooming narcissus are exceptionally fragrant this week. My crew paired them perfectly with these tall tulips. What a fitting week to celebrate Mother’s Day. 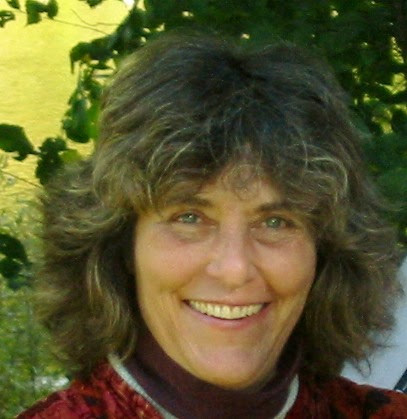 My mom left this world many years ago and I still miss her. My tradition was to bring annuals, a rose bush or a flowering shrub for her garden, and a hanging plant for the back porch, and work for a few hours to make her yard pretty. Her birthday was always the week of Mother’s Day, so we would finish the celebration with cake. When you visit the garden in front of the shop you will find this delightful combination. This week, celebrate your mom, or the mother figures in your life. I know many new moms that are also celebrating that exciting change. 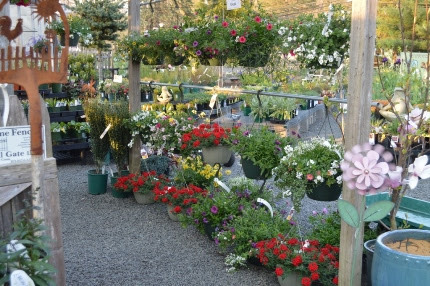 Everyone appreciates the gift of a beautiful garden, and we can help you make that happen at Natureworks! Why not bring your mom for a visit to Natureworks this week? You can stroll the gardens, take pictures, and arrange for a gift certificate to be waiting for her when she arrives. We will be serving iced mocha coffee and all moms get a fresh flower from our garden. This Thursday evening, we are having a Planting Party for Mom. We are open late and the weather will be perfect. 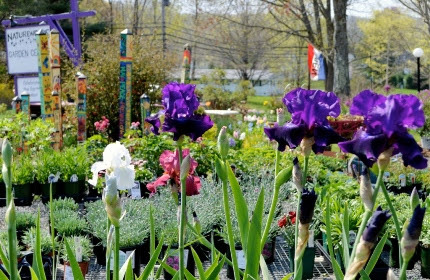 Another Mother’s Day tradition that we love is the annual May Market at the Hillstead Museum in Farmington. We will have a tent on the lawn on Friday and Saturday. There are lots of plant vendors as well as crafts and gifts of all kinds. There is delicious food, Morris Dancers, and usually baby lambs to enjoy. Plus, you can tour the museum (and see the Monets!). This is another great way to celebrate Mother’s Day with your mom or your adult children who are now mothers. 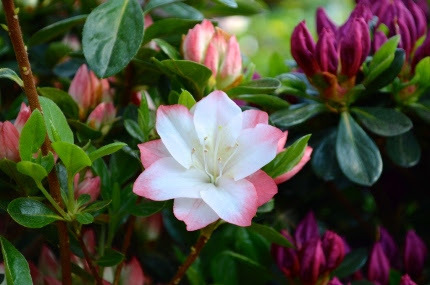 Azalea ‘Linda Stuart’ is a lovely pink and white bicolor. ‘Girard’s Fuchsia’ is the darkest purple azalea I have ever met. It is unbelievable how many new plants have arrived in our nursery yard in the past 10 days. If you want to choose a shrub for a gift, consider something that will flower in early May for years to come. 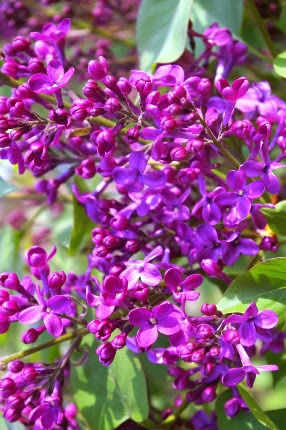 Classics include Azaleas, lilacs, Scotch brooms, and Viburnums. We have a great selection, lots of unusual varieties. ‘Pocohantas’ lilac is deep purple and an early bloomer. 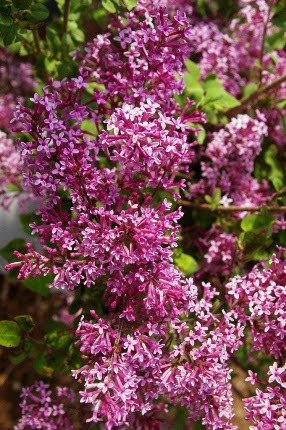 ‘Scent and Sensibility’ dwarf lilac grows only 3′ tall and 6′ wide! It smells so sweet. butterfly nectar flowers, shady foundation plantings…you name it, we have a shrub for that purpose! Once you have put together the bones of the gardenusing shrubs, we can then show you how to compliment it with perennials. This weekend is also the classic time to put up your hanging baskets. Wait till you see what my creative staff has done. Every post on our new back porch has a gorgeous hanging plant on it. We have a wall of hanging baskets in our lath house which is a stunning new display this year. Pick up a bottle of Dr. Earth Golden Bloom organic fertilizer when you buy your hanging plants. They need to be fed regularly to keep them happy. The formulation is 2-7-2, which is ideal to promote continued flowering. The May pinks are in bloom this week, and right on time. Isn’t it hard to believe that a month ago we were having deep cold and snow? Now, the flowers are catching up with the season. 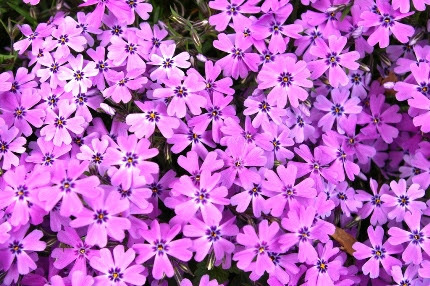 On the right is Phlox subulata ‘Purple Beauty’, my new love. Our woodland wildflower bench continues to be restocked. This week Stylophorum is blooming. 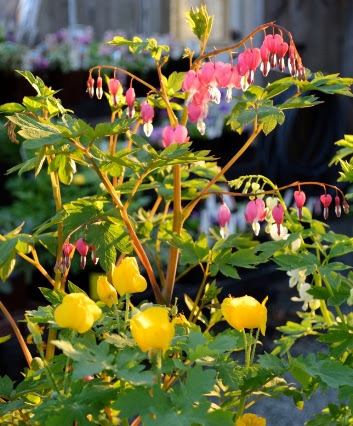 Doesn’t it look soft and pretty with the bleeding heart at the left? We also have blue and white Iris cristata, our native dwarf woodland iris. Irises of all sorts are beginning to show their colors. At my house, the dwarfs are blooming first. On our benches, many are already in flower. It seems to be happening so fast all of the sudden. 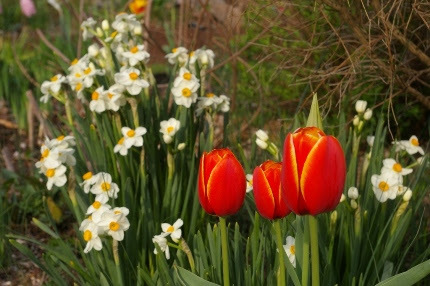 We must take the time to walk the gardens and really SEE the flowers. The most beloved ones are the most fleeting. NOW, this week, is when the “magic” really happens. We have extended spring busy season hours to make shopping more convenient for you. You can order gift certificates on-line from our website. 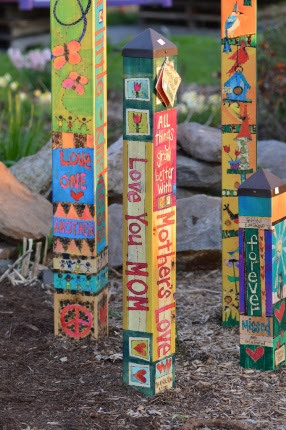 Everything and anything you could possibly need to create a beautiful garden in your own yard, or your mom’s yard, is here at Natureworks. I hope you can stop in for a visit this week.